It is with deep regret that Vintage Yacht Cruises featuring Miss Brenda Dae will not be offering lake cruises on Detroit Lakes for the summer season 2013. Several factors lead us to this decision; mainly, there just aren’t enough hours in a day. Hopefully, life will slow down a bit and allow us to return next season. In the meantime, Miss Brenda Dae is getting another makeover, so stay tuned for updates here or our Vintage Yacht Cruises Facebook page. Thank you to all who have stepped aboard, cruised and dined with us and visited our website along with our Facebook page; your friendship means so much. God bless and maybe we’ll see you next year. 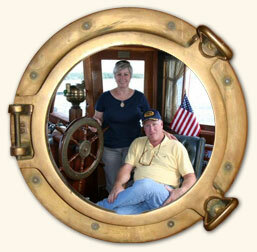 Captain Rocky and Brenda Ballinger.